by Sue Conrad for Texoma Living! The secret to making delicious pies is in making a good crust. That is the reason most people don’t make pies; the crust can be very challenging. The crust recipe I’m going to share is one that I perfected many years ago. Don’t be discouraged. We all have to learn, and practice does make perfect. I remember the first time I ever made the crust. When I poured the milk, I thought, “What a mess; this won’t ever work.” But it did, and I’ve been using this recipe for forty years now. Update: Sue Conrad retired from the day-to-day restaurant business in early 2010. 1. Always measure the ingredients in the exact amounts the recipe calls for. 2. Roll out the crust between layers of waxed paper. Do not use flour to prevent sticking. Dampen the top of the counter with a wet cloth before laying down the bottom layer of waxed paper. 3. 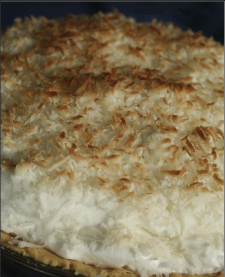 When preparing a crust for a cream pie, prick the sides and bottom of the crust with a fork after you have it in the pie plate. 4. When making a dense pie, such as a chess, it is best to bake the raw crust for 8-10 minutes at 350 before adding the filling, otherwise the bottom crust may not brown properly. Prick the crust with a fork to prevent bubbles and add pie weights or dried beans on a piece of aluminum foil to weigh down the crust if necessary. 5. Always start your pies on the bottom rack of the oven. As they become firm, move them to the top rack. Add salt to flour and stir with a fork. Add butter and oil and blend well. Add milk and mix well. Form into a ball. Roll out between waxed paper layers. Put crust into pie pan and crimp edges as desired. If preparing crust for a cream pie, prick the sides and bottom with a fork. Bake at 350 degrees until golden brown. Mix together sugar, eggs, salt and cornstarch. Add a little of the milk to blend well. Add remaining milk and coconut. Cook 6-8 minutes in microwave, stirring every 2 minutes. When thick, add vanilla and butter. Pour in pie shell. When cool, add meringue and brown under broiler for about 1 minute. Watch it carefully! Mix together sugar, eggs, salt and cornstarch. Add a little of the milk to blend well. Add remaining milk and chocolate chips or cocoa. Cook 6-8 minutes in microwave, stirring every 2 minutes. When thick, add vanilla and butter. Pour in pie shell. When cool, add meringue and brown under broiler for about 1 minute. Watch it carefully! Combine cherries, butter, sugar, cornstarch, flavoring and spices. Line pie plate with one crust. Pour in mixture. Lay second crust on top. I usually cut a “C” into the top crust. Pinch the crusts together at the edges. Bake at 350 degrees for 40-45 minutes. Mix sugar, eggs and salt. Stir in melted butter, waffle syrup and pecans. Pour into unbaked pie shell. Bake at 350 degrees for 40-45 minutes. You can find directions and tips for meringue in general purpose cookbooks such as Joy of Cooking, Betty Crocker and Good Housekeeping. I have had the great pleasure of tasting Sue’s pies and other magical creations and she is a master. Such an icon of our city too. A woman with a voice of love she put into her dishes and gave a taste of home cooking each time I got to go to her cafe. Sue has made her mark on Texoma. She does us proud. Some pundit on radio had the nerve to say that American workers must be more productive if we are going to get this nation back on its feet. Exactly what does that mean? I’m obviously clueless as to how much can actually be done in a typical 10-12 hour day. By the time I head home in the evening my mind is ready to explode. How about you?